The ultimate guide to making Chinese dumplings from scratch. 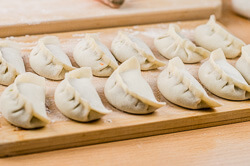 The dough can be used for both boiled dumplings (shui jiao, 水饺) and potstickers (guo tie, 锅贴). 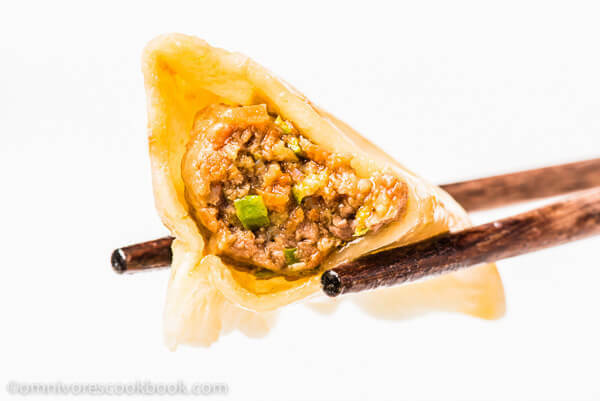 The dumpling wrappers are tender and thin, with a silky mouthfeel. In China, when we talk about dumplings, we’re usually referring to boiled dumplings (or shui jiao, 水饺). Not potstickers, not steamed dumplings, but boiled ones. We consider it a staple, a delicious alternative to rice and noodles. You might think boiled dumplings are not as tasty as potstickers. After all, potstickers have a nicely charred surface and crispy texture and look great, right? But to us, boiled dumplings are the ultimate comfort food that we eat every week. They’re super delicious if you make them the right way. Boiled dumplings are moist and juicy. 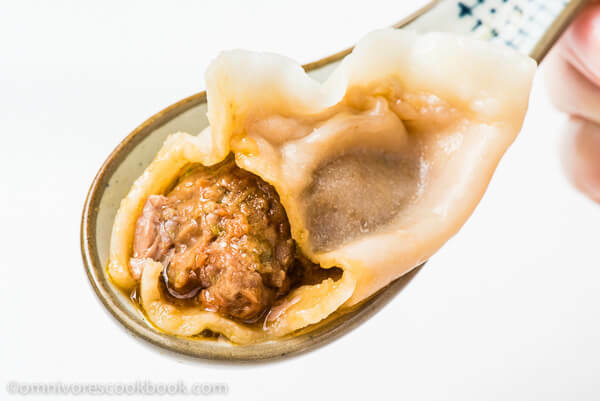 With a small bite of a dumpling, the hot and flavorful soup will drizzle from the filling. If you’ve ever tried Shanghai soup dumplings (xiao long bao, 小笼包), you know what I’m talking about. 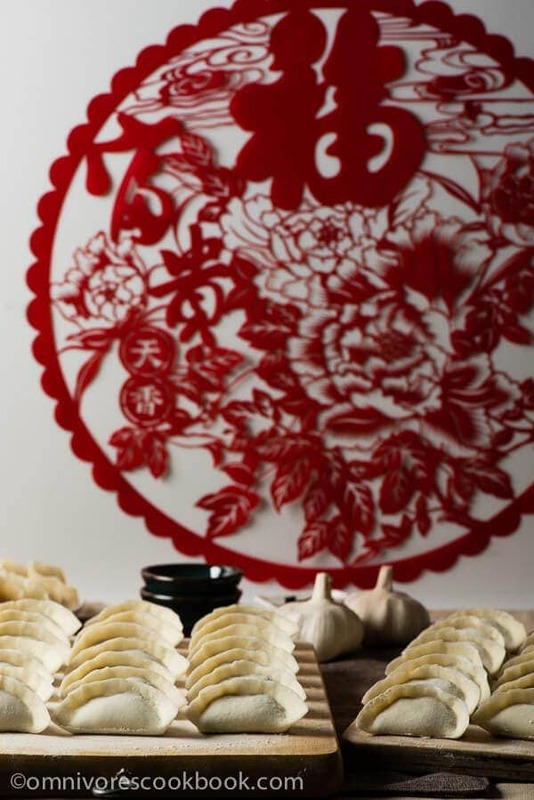 The handmade dumpling wrappers are thin, tender, and delicious. The filling is well balanced with meat and vegetable, not too greasy, nice in flavor, and comforting. Everything works perfectly together to create a fulfilling, healthy, and hearty one-dish meal. As for the fillings that can be used for boiled dumplings, the list never ends. Today I’ll give you a thorough introduction to making dumpling wrappers from scratch, wrapping dumplings, and cooking and storing them. So no matter which filling you prefer, you can always refer to this recipe to make dumplings. I will discuss dumpling fillings in another post. It’s not for beginners. Unlike potstickers and steamed dumplings, boiled dumplings require quite some skills to wrap so that they won’t fall apart during boiling. 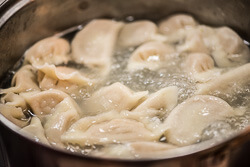 Unlike wontons, for which it is OK that they fall apart in the soup (because the soup is flavorful), a broken dumpling will lose almost all of its flavor. It will end up plain and tasteless. It requires a lot of work. To put it more precisely, it requires teamwork most of the time. One reason is that the wrappers will dry out really fast. So, unless you’re super fast, it usually requires two people for effective workflow – one person in charge of rolling the wrappers and the other person doing the wrapping. It’s time consuming. If you make steamed buns, you will find it only takes a few of them to make a filling meal. However, dumplings are small and super comforting, which means it’s easy for one person to finish 20 of them in no time. Thus, you will need to make a lot of dumplings. They are delicious and comforting. A properly made dumpling is really moist and even soupy. Compared to potstickers, their wrappers are thin and tender. The filling is very juicy and mouthwateringly good. It is the kind of comfort food that you’ll want to eat after an exhausting day at work, on a cold winter day, and when you feel under the weather. Teamwork is really fun and rewarding. You can get everyone in the family involved and cooking this dish together, making the cooking easier and faster. Each person will be in charge of one step of the process, and there is plenty of time for chatting and laughter throughout. Then everyone will enjoy the delicious dish that each person worked together to create. Sound good to you? It’s healthier and low in calories. 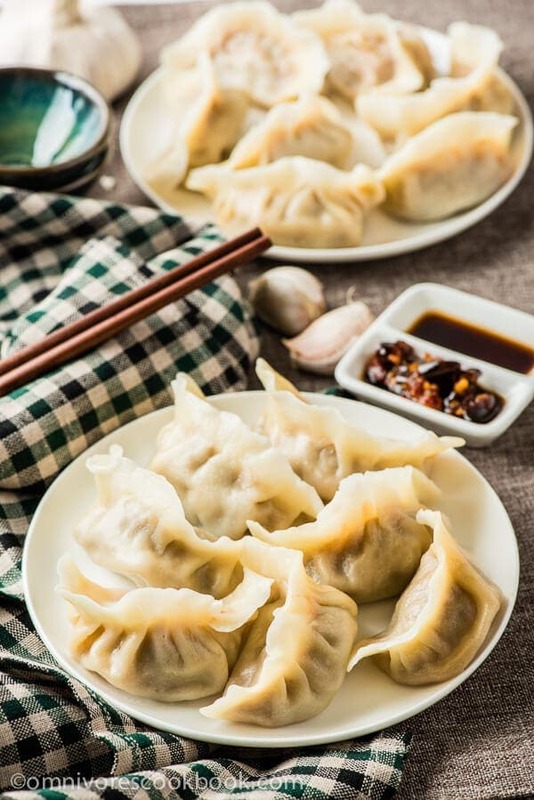 Dumplings contain a good amount of protein, vegetables, and carbs, so they are a nutrition-balanced one-dish meal by themselves. Unlike potstickers, they don’t require any oil to grease the frying pan. So each dumpling contains fewer calories. It’s delicious. OK, I’ve said this once already. But it’s worth repeating! Have I convinced you to cook some dumplings at home yet? If yes, keep reading. Let the dough rest enough. If you don’t have enough time, you can use the dough after it’s rested for 1 hour, at least. But the dough will be smoother and more springy if you let it rest longer. Make tougher dough. To make the dough work, it’s better to make it a bit tougher than softer. 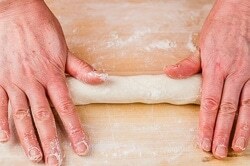 If the dough is too tough and difficult to roll, let it rest for 3 to 4 hours; it will become soft enough to work with. But if the dough is too soft, it’ll be difficult to wrap and the dumplings won’t keep their shape. Move fast once the wrappers are ready. Because they dry out very fast, and it will become difficult to seal the dumplings later. If you work solo, you can make small batches of wrappers (10 to 12) each time and fold the dumplings soon after. Or, you can work as a team. One person can roll the wrappers while the other person simultaneously wraps the dumplings. Cook or store the dumplings soon after they’re wrapped. The dumpling filling usually contains liquid from the vegetables, and this will make the finished dumplings moist. But if you let the dumplings sit too long, the moisture will be absorbed by the dough. This will cause the dumplings to fall apart during cooking. What you can do is to freeze each small batch you just wrapped before moving onto the next batch. 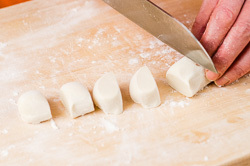 Cook the frozen dumplings before servings, so their texture is as good as the fresh ones. 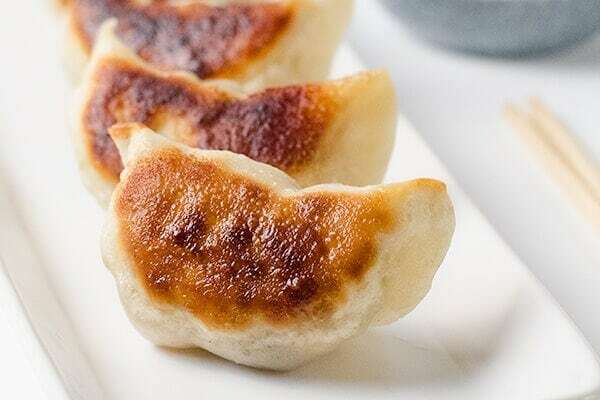 Cook dumplings in small batches in a large pot. Cook 20 to 25 dumplings at a time, or fewer if the dumplings are larger, so the dumplings won’t stick to the pot. Never take your eyes off the pot when boiling the dumplings. This is the trickiest part. The whole boiling process will be less than 5 minutes. If you leave the dumplings to cook in the water a bit longer than they need, they will start to fall apart. Check the recipe below to see how to make sure the dumplings are cooked just right. Here is a short cooking video about how to make Chinese dumplings. What if I still want to cook potstickers? 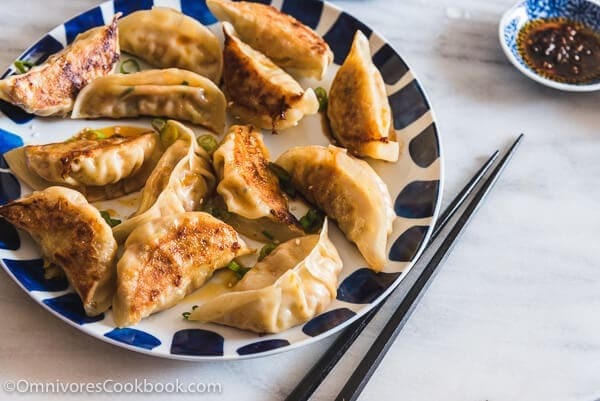 That is OK, because the dough can be used for both boiled dumplings and potstickers. 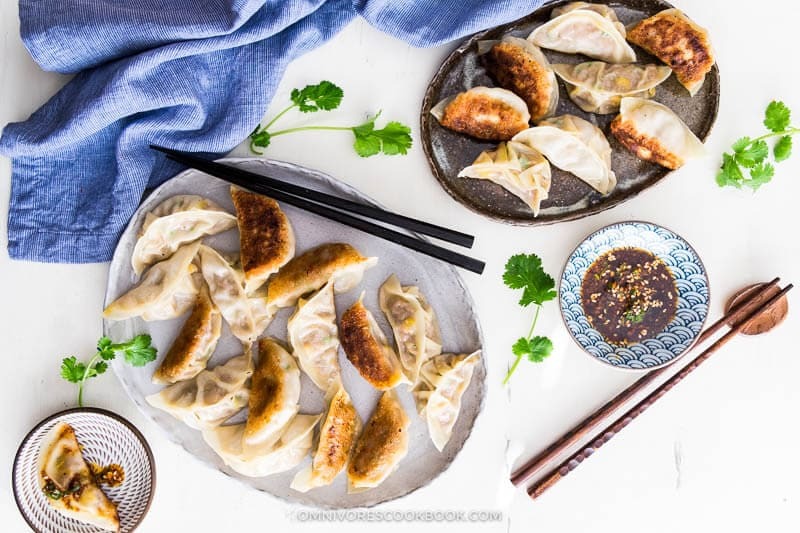 For cooking potstickers, the process from dough-making to dumpling-wrapping is exactly the same. You can refer to the “to cook potstickers” session in the recipe next page. When you cook potstickers, it won’t cause a big problem if the dumplings aren’t sealed well. However, I still suggest you seal the them carefully. If they fall apart during cooking, the liquid will spill and evaporate, and the finished potstickers won’t be as juicy or moist. Also take note, this dough is not for steamed dumplings. 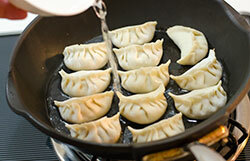 For cooking steamed dumplings, you should use hot water to make the dough, so it will be tender after steaming. I will write about making steamed dumplings another time! 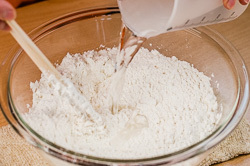 Add flour into a large bowl. Slowly pour the water into the bowl, mixing them together with a pair of chopsticks. 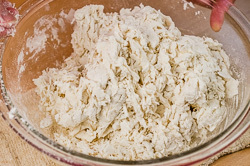 When the water is mixed with the flour, dust both hands with flour and start kneading to form dough. The dough will be quite tough and should easily be able to be lifted from the bowl without sticking to the bottom. 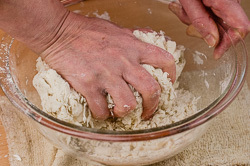 When dough has formed, dust the working surface with flour and dust hands again. 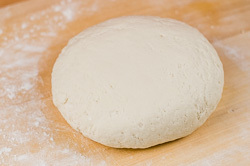 Transfer the dough to the working surface and continue to knead it until its surface becomes smooth, about 10 minutes. Rinse a clean dish towel with water. Dust the bottom of a large bowl with flour and transfer the dough into it. Cover bowl with the damp dish towel and a lid (or plastic wrap). Let the dough rest for 2 hours. You can let the dough rest longer, 4 to 5 hours. 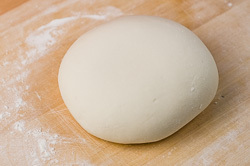 After resting, the dough will be softened and have a smooth texture. 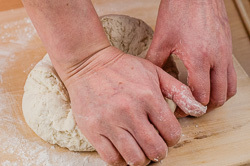 Dust the working surface and your hands with extra flour and transfer the dough onto the surface. Knead the dough repeatedly for another 3 to 5 minutes, until the dough hardens again. Let the dough rest for about 30 minutes (or longer). During this time, you can prepare the dumpling filling(s). Dust the working surface again and transfer the dough onto it. Slice 1/6 of the dough off and place the rest back to the big bowl. Cover it with the damp dish towel. 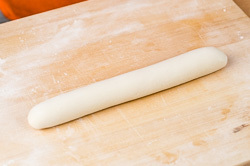 Roll the dough into a long stick, 2.5 to 3 centimeters (1 inch) in diameter. 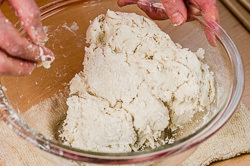 Use a knife to cut the dough stick into about 12 small doughs, each weighing 12 to 14 grams (0.4 to 0.5 oz) (*see footnote 2). Slightly dust both sides of each small dough with flour. Work on them one at a time. Dust the working surface again. Take one dough and press it to a round disc. Roll it with a rolling pin into a round sheet (refer to the video to see how). Try to roll it so that that the edge is thinner than the center. The wrapper should be about 1 millimeter thick (i.e. almost same as the thickness of a CD), and the diameter should be about 7 centimeters. It is ok if the wrapper is not perfectly round. Starting here, you should work as quickly as you can, because the wrappers will dry out quickly. And if they do, you will find it very difficult to seal the dumplings later. If the wrappers dry out when you start to fold the dumplings, brush a bit of water over the edge so you can still seal the dough. Scoop about 1 tablespoon (or less, so you can easily fold the dumpling) of dumpling filling and place it in the center of the wrapper. 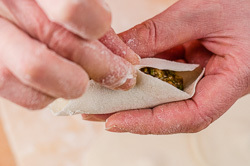 Hold the dumpling with one hand and start sealing the edges with the other hand (refer to the video to see how to fold a dumpling). 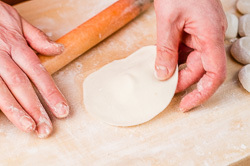 Be careful, when you press the edges together to seal the dumpling, do not let filling touch the sealing area (the dumpling will fall apart if you do). After folding, press edge again to seal well. You don’t need to fold beautiful dumplings here; our goal is to make the dumplings hold their shape during boiling. 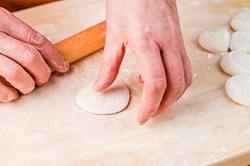 Place the dumplings on the working surface and work on the rest of the doughs in the same manner. Try to wrap and cook dumplings in small batches (20 to 25 dumplings at a time). If you won’t cook dumplings soon after wrapping (within 30 minutes), freeze them first (refer to the session “to store dumpling” below). If you want to know the reason, read the session of “Things you should take note of” above. Carefully add dumplings one at a time into the water. Use a big ladle to stir the water gently and continuously, until the water starts to boil again, so the dumplings won’t stick to the bottom, for about 1 minute. Adjust the heat so the water is at boiling point, but isn’t bubbling too fiercely. 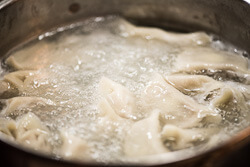 When the dumplings float to the surface, continue boiling until the dumplings are filled with air and swollen, and the dough starts to become transparent, about 1 minute (*see footnote 3). Immediately transfer all the dumplings to a plate. (*) Be careful, the dumplings cook quickly and you should always stand beside the pot throughout the boiling process. When the dumplings are cooked, they will start to fall apart within seconds, so transfer them as soon as possible. Heat a tablespoon of oil in a nonstick skillet over medium high heat. When oil is hot, place potstickers in the skillet, pleat side up. Swirl 2 tablespoons water in the skillet, cover immediately, and turn the heat to medium. 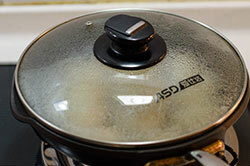 Cook covered until the water is evaporated and potstickers are cooked through, 3 to 4 minutes. Remove the cover and flip one potsticker to see whether the bottom side is charred. If not, turn to medium high heat and cook until the bottom side turns golden brown. Transfer the potstickers to a plate. Option 1: Serve with Chinese black vinegar and a few ginger slices. Option 2: Serve with 1 tablespoon Chinese black vinegar + 1 teaspoon light soy sauce + 1/2 teaspoon sesame oil. Option 3: Serve with Chinese black vinegar and a few drops fresh Chili oil. 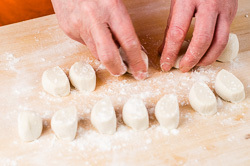 If you plan to store dumplings or won’t serve them immediately, always freeze them uncooked. It won’t affect the texture or flavor of the dumplings. Dust the bottom of a big airtight box with a thin layer of flour. Place the dumplings, one finger’s width apart. Store in the freezer for up to 2 months. Bring a large pot of water to a boil. Add dumplings into the water. Use a big ladle to stir a few times. Cover and cook until the water starts to boil again. Adjust the heat so the water will keep boiling without spilling. Cover and cook for 3 minutes (up to 5 minutes for bigger dumplings). Uncover pot. Continue to cook for about 1 minute (up to 2 minutes for bigger dumplings), until cooked through. Transfer to a plate immediately. 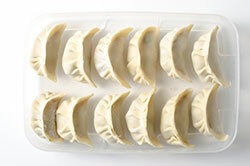 Store leftover boiled dumplings in airtight container in the fridge and consume as soon as possible, within 1 to 2 days. To reheat in microwave – Add dumplings into a bowl and sprinkle with a few drops of water. Cover and heat until warm. 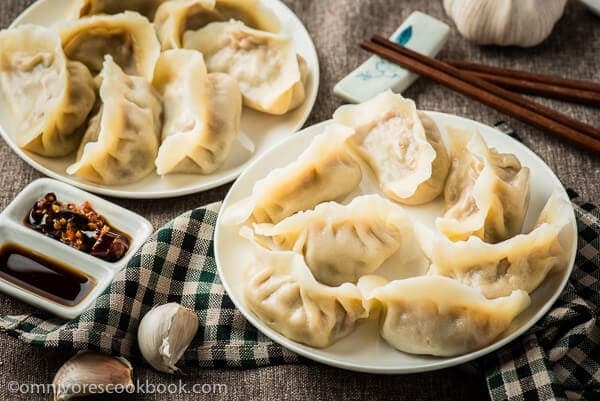 To reheat by steaming – Place dumplings in a bowl. Place a tall-rimmed plate upside down in a pot and add water to cover. Place the bowl of dumplings on top. Heat over high heat until water is boiling. Continue cooking for 5 minutes. To pan fry – Grease a nonstick skillet with a thin layer of oil and heat over medium heat. When skillet is hot, add dumplings. Swirl in a tablespoon of water, cover immediately, and cook for 2 to 3 minutes. (1) Make sure you sift the flour into the cup and level it with a chopstick. If you scoop the flour with the cup directly, you will end up with 1/3 too much flour. (2) This recipe makes relatively small dumplings. They are easier to wrap and work better for fillings that contain more moisture. Depend on the filling you use, you can also make slightly bigger dumplings. (3) The cooking time here is just for reference. Actual cooking time will depend on the heat, the type of stove you use, the size of the dumplings, and the type of filling. 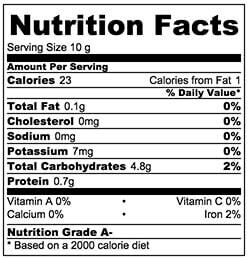 The nutrition facts are calculated based on 1 of the 80 wrappers generated by this recipe. Happy New Year Maggie! I love dumplings, but always eat them out! Love the tips and of course the video, so helpful! Pinned! 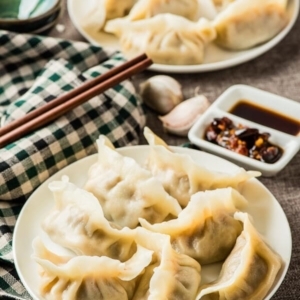 Maggie, You were not kidding by saying “the ultimate guide to making dumplings.” WOW! Fantastic technique on rolling the dough and I was fascinated there was no need to wet and seal them. You make this look effortless, yet having made these numerous times I know what a labor of love these are. Fantastic post and photos! Thanks! Happy New Year, Maggie! Your dumplings are absolutely perfect! This is such an amazing tutorial too! Hope you are having a wonderful time celebrating with your family! Wishing you all a happy, healthy and prosperous new year! Oh… my… gawd! Maggie, these dumplings look and sound AMAZING! Happy New Year, btw! What a fabulous way to celebrate! I love all of your fabulous tips and your pictures are incredible! Next time I make dumplings, I am definitely following your recipe! Maggie, oh my gawd girl! you made the dumpling wrappers from scratch!!! Whoa!!! I am amazed!!! These look fabulous and are beautiful! Happy Chinese New Year!!! 新年快乐!!! Wishing you and your family a very happy and healthy Chinese New Year! Amazing handiwork, you are such a pro! Fast and perfect are your little delicious shui jiao. We love shui jiao too as it is so comforting and a perfect way to bring in the new lunar year. So now here is the question of the day, how many dumplings can you eat at one sitting? My boys can easily eat 30 of them per teenager… I would need to recruit more help to make these from scratch! You are such an inspiration as I bet your handmade wrappers taste so much better than the ones from the wet market and the texture is just gorgeous! Your videos and step by step process are so helpful and I am sure we all need to bookmark this one to try later. Sharing everywhere, of course! Hi Bobbi, thanks so much for all the kind words! Xin Nian Kuai Le! And have a great weekend! Once again, such an amazing post, Maggie! I CAN NOT wait to try this!!! Happy New Year! I love steamed dumplings. I have been wanting to try making them myself. I love how detailed your notes and recipe are! Even though the dumplings look like a lot of work, I enjoy such challenges (when I have time! ), so I would love to try your recipe. It would be wonderful, if you would post a recipe for pork filling for the dumplings, also. Hi Kim, thanks and Happy New Year! I’m so glad to hear you like this recipe. Hi Maggie I would like to know the processes and ingredients for the filling Thanks. So informitive and just what I’ve been looking for. I really enjoyed your post. I would love to try making the dumplings. I tried potstickers this week, and was very pleased with the way they turned out. My husband spends alot of time in Shanghai, and I went with him one time. The lines we saw at the dumpling places was something to see. I hope to see a post for the filling of the dumplings. Hi Ruth, thanks so much for leaving a comment and I’m glad to hear the potstickers turned out well! So far I have two dumpling filling recipes. thanks for this post! Would love to see a post for the steamed dumplings! Thanks! Good luck Pamela! Making dumplings do require a lot of patience and practice. I hope you’ll nail the dough and create mouthwatering dish! Do I have to let the dough set? Will it turn out differently if I just use the dough right after and I make it and knead it? And I looovvveee this tutorial! So thorough and they look delicious! Looks so yummy!! I love all your tips for the dumpling skin. So helpful! 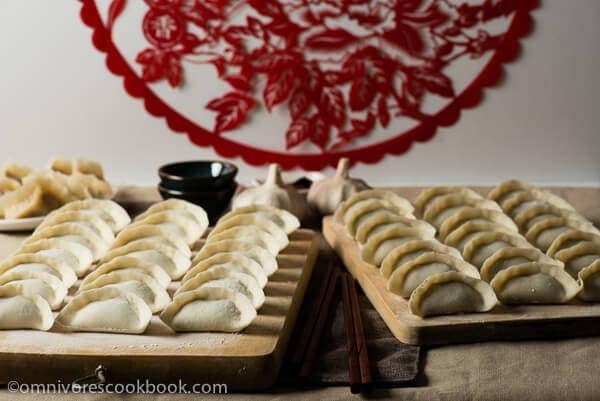 Do you happen to have a good vegetarian dumpling recipe? We have some friends who are vegetarians and I’d love to be able to offer them dumplings too. Hi Amy, I actually have two vegetarian dumpling recipes and I’ll write about them soon. When we’re cooking vegetarian dumplings, we usually make it to buns or steamed dumplings. They are bigger in size and easier to wrap. I will let you know when I post the recipe! I will definitely be making these. Love Lamb! They will be the perfect dish to christen my new wok. It’s cast iron and I can’t wait to use it! Can I ask where you got your wall hanging? It is really beautiful. Can make the dumpling and freeze it for 1week in the freezer ? Or can I make the dumpling skin and freeze it? I think it take longer time to make the skin (need time to rest the skin) ? Wow.. Amazing guide. Thank you so much for the effort you have put in for all this.. now I know how to make Chinese Dumplings!!! Fantastic Details. Love your tips & info. Well done! I make my dumplings from scratch too! But I LOVE your photos and direction. I have been making from scratch since I was a little kid with my parents. But I find that using a kitchenaid with the kneading attachment and the pasta attachment (to flatten dough) makes the process super easy. And I use a Stainless Steel Round form (like a biscuit cutter) to cut it into identical sizes. I usually make 60 or so dumplings in one sitting by myself. I use wax paper with flour and baking dishes to cover the finished skins so they don’t dry out. Hi Juliette, glad to hear you like my post! It is interesting to hear about your experience of making dumpling wrapper by using KitchenAid. I’ve never used the KitchenAid pasta attachment but I tried it with a traditional pasta machine. My problem is, sometimes I found dumpling dough is bit too tender to roll out through a pasta machine. I always thought dumpling dough is supposed to be tenderer than pasta dough, otherwise the dumpling will turn out tough. Seems like I was wrong! Do you use the KithcenAid to make cold water dough or hot water dough? Or is it possible to do both? Now I’m super intrigued and want to buy the KitchenAid attachment to try out! It works really well! i use flour on the roller itself so it doesn’t stick. and instead of the cold water (like you use), I use boiling water in my dough. I haven’t tried cold water, but will try on my next batch. Using the roller doesn’t impact the quality at all. I do knead it a lot though. I usually make the dumplings by myself, so i really don’t have the time to roll them out by hand. Thanks for your prompt reply Juliette! When I make dumpling dough I use the cold water dough for boiled dumplings and hot water dough for steamed dumplings. It’s just the way my mom taught me. I think cold water dough might work even better, because the dough is usually tougher. Me too, I make dumplings myself and I don’t like the packaged wrapper at all. I usually prepare a whole afternoon, make a huge batch and freeze them. So happy to know I can make them faster now! Rolling by hand is too time consuming. Would this work with spelt flour? Hi Belsante, I’ve never cooked with spelt flour before. From what I read online, you can use white spelt flour to replace all-purpose flour. If you’re using whole spelt flour, you probably need to use a different flour water ratio and the dumpling might come out a bit tough. The article also mentioned the gluten in spelt flour is more fragile, so you should knead it gently to prevent it from over-kneading. I would test it by making a small batch if using whole spelt flour. Merci Maggie, tes recettes sont extra. J’adore ta cuisine. This is a great recipe, I can’t wait to make these for my family. One question though: When I had these in Tianjin, the dumplings were served in bowls of water, the water they served it in was delicious, you could drink it, it was so salty and full of flavour, would they have added things to the water? or was that simply the result of boiling the dumplings in that water? Hi Liam, we usually serve the dumpling water separately, by itself. It is usually plain, or seasoned with just a pinch of salt. If the broth you tried was flavorful, it is probably a broth (maybe chicken and / or pork), some soy sauce, and sesame oil. 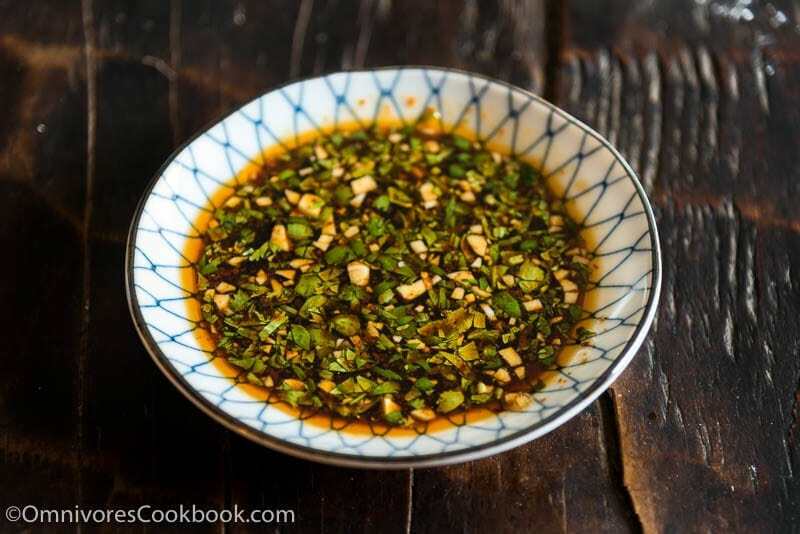 To make a quick broth, you can use this recipe: https://omnivorescookbook.com/soy-sauce-noodles (and of course replace the noodles with dumplings). This is the best explanation and detailed ever. 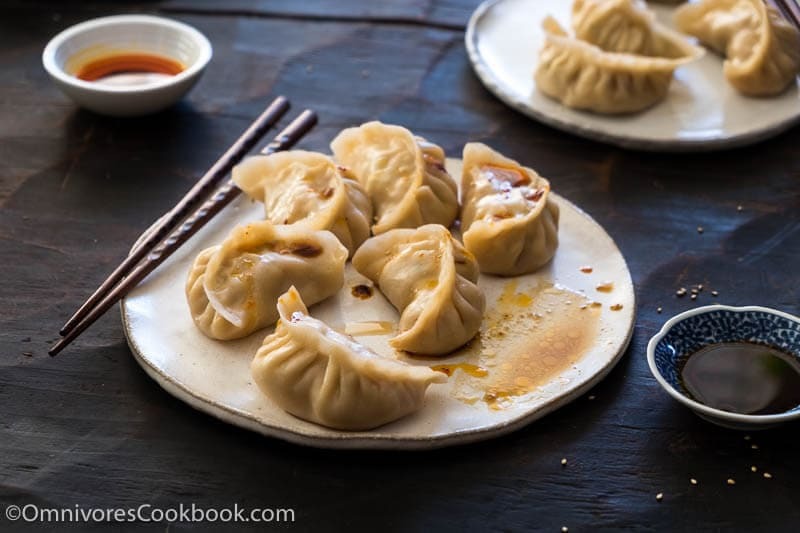 Lots of tips also on the dumpling mistakes I have been making… I’m excited to try your technique! Will have to check out more of your blog – I love cooking Chinese food too. can I steam the dumplings instead? Happy cooking and looking forward to hearing your feedback! I have a question: Can this dough be used also for steamed dumplings? maybe doing it a little thinner? This dumpling dough is designed for boiled dumplings, and it will turn quite tough if you steam them. Happy cooking and I hope the steamed dumpling recipe works for you! Made these and they turned out wonderful! Only wanted to do a small batch since it was my first time, so divided the recipe by 5 and got about 8 dumplings out of it. Also was a bit impatient and formed them only after waiting 40 mins for them to rest. Next time will definitely try for longer. 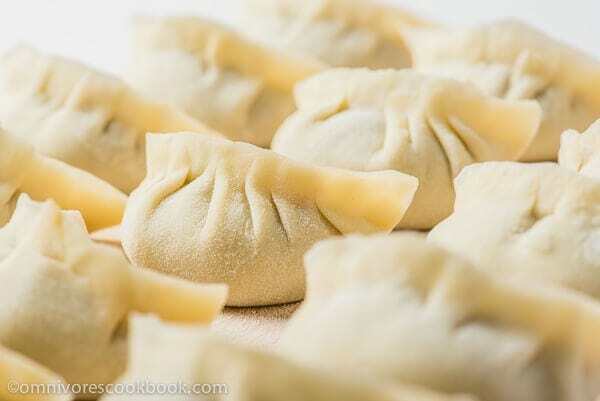 Can you refrigerate the dumpling dough overnight and form the dumplings the following day? Or does it all have to be made the same day? Hi Joanna, yes, you can refrigerate the dough overnight. 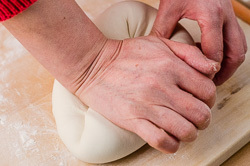 It will get quite soft the next day and you might need to knead it a few minutes to bring it back before rolling out. I made a double portion of this, and it was a big hit! Definitely upped my Chinese street cred. I made these in winter, so the dough definitely took 4-5 hours to soften up. At the 3 hour mark I was a bit panicked since guests were going to arrive and help make these, but by the 4 hour mark, they were much better. In the past, my parents would use boiling water, which speeds up the resting process significantly (1 hour). Serious Eats offers similar directions. However, I would say that with the boiling water technique the dough does come out softer, and has more of a tendency for the pinched seams to open back up. With these, they stayed perfectly sealed before cooking. Also, really follow the directions about boiling 20-25 dumplings at a time for no more than 3 minutes (room temp) or 5 (if frozen). I did one batch per directions (great!) and another mom took over and put in 50-60 dumplings in the pot. That took much longer to cook, and in that time many dumplings fell apart. The potsticker version is also fantastic, and the skins held up perfectly. Hi Maggie, can i refrigerate the wrappers to make potstickers some other time? 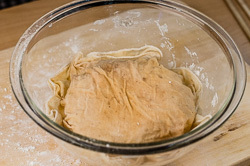 or use this dough recipe to make bulk wrappers for potstickers. Do you have recipe for wonton skin too? My 2 young grandsons want me to make “chinese dumplings” – they have seen a picture in their Chinese classroom in MN. BUT they are asking if I can make them without meat, fish or vegetables! They Want Cheese! Have you ever heard of such a thing, and would you be able to advise me what to do? If not, I will follow your Great Video and experiment with a “cheesy” filling. Thanks! Looks like a easy solution and value of deliciousness can fulfill my expectations Let me try. My daughter (7) has fallen in love with Grace Lin’s books, most recently Dumpling Days, and now REALLY wants to make dumplings (there’s a recipe in the back of the book). I’m a decent cook, but I have no experience making dumplings and fear it may be too difficult for us. Can you recommend something similar, but easier, that would be a fun introduction to Chinese cooking for kids ? Thank you!